A SCDN is a Content Delivery Network that utilizes satellite as a broadcast medium to distribute popular content across a CDN’s servers. As a CDN provides faster user access to content by geographically distributed servers in between the client and the content provider, satellite provides an alternate way for content providers push popular content onto the CDN's servers. Combined with a terrestrial CDN, a Satellite CDN reduces traffic on terrestrial networks especially if many people are requesting the same content. The figure above shows a basic SCDN setup built using MobilityFirst? (MF) components. 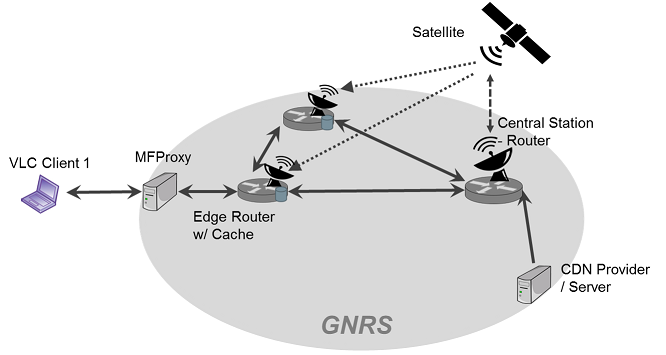 The goal of this project is to improve the components of the Satellite Content Delivery Network (SCDN) MobilityFirst? (MF) setup, specifically the MFProxy. 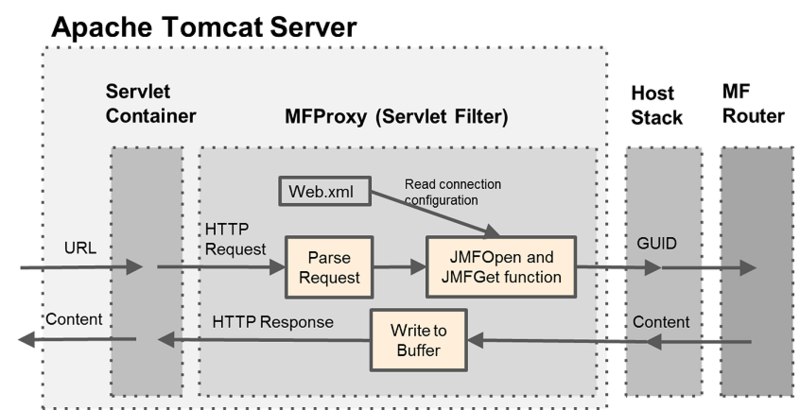 This was done by re-implementing the MFProxy as a Java Servlet filter in an Apache Tomcat Server. Within the SCDN, the MFproxy ensures that the client can properly request content and then receive that content. The project is being implemented in the Netbeans IDE (v 8.02) with the tomcat server (v 8.0.27) that comes from the Netbeans installation. This application is mainly being implemented using a Filter in an Apache Tomcat server. The filter processes all requests before it is sent to a Servlet which can also process requests. This is to provide a higher-level filtering for requests that are specifically understood and have specific functions that are unrelated to other functions of the Servlets that can be implemented in the server. Implemented as a Tomcat server, the MFProxy has several advantages to it's previous implementation as a Mongoose (C/C++) server. However this is likely at the cost of performance, as Mongoose is an embedded web server implemented in a lower level language. Seo Bo Shim - rising junior in Electrical and Computer Engineering Undergraduate Program at Rutgers University. Seo Bo Shim.jpg​ (4.8 KB) - added by Seobo 3 years ago. MFProxy.2.png​ (99.4 KB) - added by Seobo 3 years ago.